IN his continuing search for the more weird and wondrous in this world, David Ellis says this popular and colourful "art wall" in Seattle, Washington is made up, would you believe, of 1,000,000-plus pieces of used chewing-gum. Or was. Local authorities have finally got to work with super-heated steam sprays and good ol' fashioned muscle power, to clean off the sticky mess that's been building up since the early 1990s. That's when patrons queueing for tickets to the Market Theatre began sticking their used gum on the surrounding walls, and pushing small coins into it in the belief it would bring good luck. After some years they gave up on the coins that kept falling off, but continued to attach their gum to any empty spaces. And when they ran out of these, they piled layer upon layer of the stuff so that in some places the mess is up to 15cm thick for 15m along both walls outside the Theatre. Authorities concede that while the bizarre wall is doubtless one of the world's most germ-laden tourist attractions, it is in fact not as great a health hazard as kissing Ireland's Blarney Stone – and is being cleaned down not for health reasons, but because the sugar in the gum is corroding the theatre's brickwork. 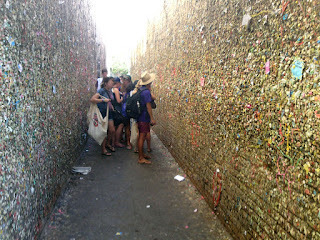 And after the US$4,000 clean-up job is complete, the faithful will be able to return to their old habits of sticking used gum wherever they like along the walls outside the Market Theatre. SOMETHING to chew over as you contemplate what awaits in the night's production at Seattle's Market Theatre – this colourful "art wall" is being cleaned of its 1,000,000-plus pieces of stuck-on chewing gum.